We’re thrilled to see Nathaniel Popper of The New York Times include Brian Behlendorf, Hyperledger Executive Director, in a roundup of the top 10 most influential leaders advancing blockchain technologies in the industry today. Brian has led a life-long career in open source technology starting off as a primary developer of the Apache Web server, the most popular web server software on the Internet, and a founding member of the Apache Software Foundation. 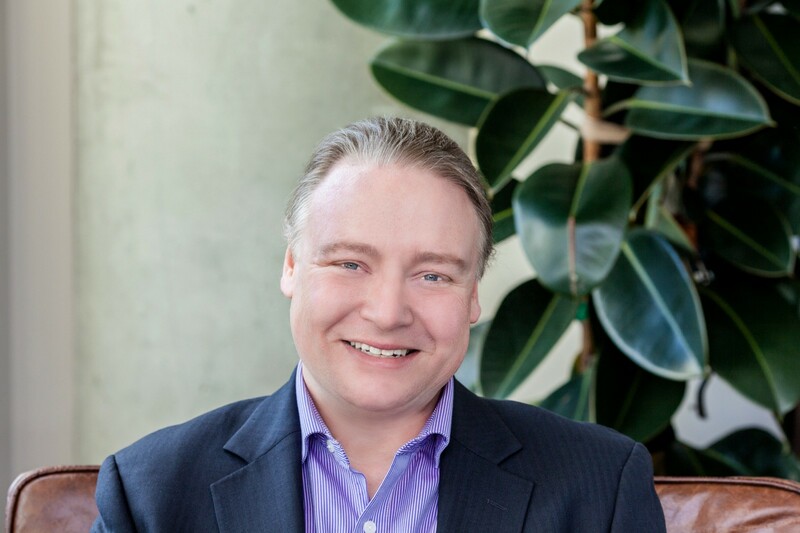 Often referring to himself as the “Geek Diplomat” of Hyperledger, Brian has successfully led the effort to attract more than 235 members from all over the world, pulled in hundreds of developers to contribute code and grown the consortium to include 10 tools and frameworks over the past two years. All this has made Hyperledger the fastest growing open source project hosted by The Linux Foundation to date. Laura Shin wrote another story in The New York Times, that explored how various industries like healthcare, government, food, supply chain management and trade finance are turning to blockchain to improve efficiencies and enable new business models. Brian Behlendorf is quoted in the article saying companies must transform and adapt their business models to leverage blockchain if they want to remain competitive. The article referenced Northern Trust as an example of blockchain in production today. Northern Trust utilizes Hyperledger Fabric to automate the paper-intensive process of investing by pensions and endowments in private equity. Hyperledger technologies run in production deployments and provide real value beyond finance as well. Take for instance, PokitDok, which created a Hyperledger Sawtooth-powered platform called DokChain that manages smart contracts, resolves patient identities, controls access to personal health records, settles healthcare claims and fuels complex medical supply chains. Another example is Change Healthcare, which last year, signed on as the first healthcare Premier member of Hyperledger. They announced their Intelligent Healthcare Network, built on Hyperledger Fabric, for claims management transparency. With it, organizations can accurately track, in real time, the status of claims submission and remittance across the complete claim. The fact is companies from small startups to large prominent tech companies are betting a chunk of their business on the future of these technologies. SAP, Oracle, GE, Amazon and Huawei announced Blockchain-as-a-Service products within the last year, all powered by Hyperledger technologies. We, at Hyperledger, proudly support this innovation. Hyperledger’s end vision is to create the foundational infrastructure that will power enterprise distributed ledger applications and systems and allow for decentralization. And the future is looking very bright! You can check out many other projects, pilots and production deployments of Hyperledger (or add your own) via our Blockchain Showcase. You can also plug into the Hyperledger community at github, Rocket.Chat the wiki or our mailing list. As always, keep up with what’s new with Hyperledger on Twitter. 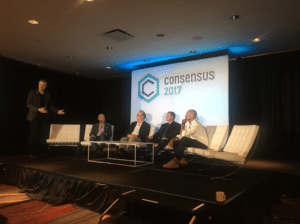 Consensus 2017 is a Wrap! The Hyperledger team (and 40 of our members!) 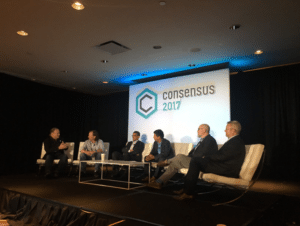 spent a good amount of time in New York for CoinDesk’s annual Consensus conference last week. It was a great event with tons of excitement and enthusiasm around blockchain and its many applications. Attendees were from all walks of life – from developers to architects to financial services professionals to healthcare specialists to investors – all trying to better understand the best and most practical use cases of the technology. 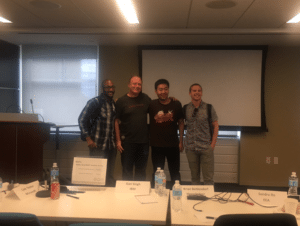 The event kicked off the weekend before with the Building Blocks Hackathon at 30 Rockefeller where many of the world’s top blockchain developers vied to build the next killer smart contract app. Participants could build on top of any blockchain protocol: bitcoin, Ethereum, Hyperledger or otherwise. And through various sponsor challenges, they were encouraged to leverage the software and support made available by our world-class mentors in order to deliver projects. Hyperledger was a sponsor of the event. The Hashed Health development team ended up winning the Hyperledger challenge, which was to create a game using any of the Hyperledger frameworks. Jonathan Levi, an active Hyperledger community member and the founder of HACERA, won 2 hackathon challenges using Hyperledger technology. They won the Enterprise Ethereum Alliance challenge and they were one of the winners of the Microsoft challenge. They called their solution Dutchess – a secure decentralized Chess on the blockchain that allows players to use ETH to pay for an unfair advantage in a sealed-bid Dutch auction. The entry highlighted Jonathan’s and HACERA’s approach of integrating multiple permissioned & public chains. The result was a mini HACERA-like workflow that provided secure, auditable, privacy preserving, that prevents impersonation, relying on self-sovereign identity and offers a non-repudiation guarantee – with a playable fun game of Chess on a blockchain. 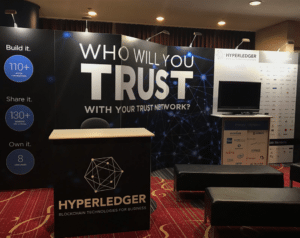 Early Monday, the Hyperledger team then set up shop on the 6th floor of the Marriott Marquis in Times Square. Crowds of attendees stopped by each day to learn more about the technology. At the booth several member companies gave demos on different Hyperledger projects including Hyperledger Fabric and Hyperledger Iroha. Cloudsoft demonstrated Deploying Hyperledger Fabric on Kubernetes with Cloudsoft AMP. IBM showed Connect a Cloud, connecting organizations together on Hyperledger Fabric using hosted cloud providers of choice. Soramitsu ran a KYC/user identity demo of Hyperledger Iroha/Android app and video, and Byacco, a local digital currency currently in use at University of Aizu in Fukushima, Japan. IntellectEU together with their customer Telindus (Proximus Group) explained streamlined asset transactions through reconciliation, matching and resolution among multiple parties. 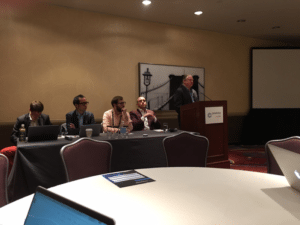 Hyperledger also hosted a Roundtable on Monday on its distributed ledger technologies, Hyperledger Sawtooth and Hyperledger Iroha, each technology had end users speak to their different use cases. Kelly Olsen from Intel spoke to Sawtooth and his user, Pokitdok CTO, Ted Tanner weighed in on how they are utilizing Sawtooth in their healthcare blockchain solution. Makoto Takemiya, CEO, co-founder, Soramitsu discussed Hyperledger Iroha as a blockchain framework for mobile applications and Soichiro Takagi, from the Center for Global Communications (GLOCOM), International University of Japan shared his experience with the technology. 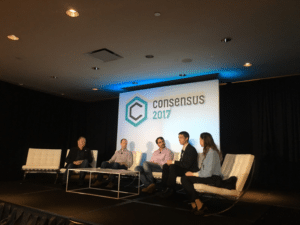 In addition to the robust line-up of Hyperledger activities in the main Consensus program and on the show floor, Hyperledger hosted a series of talks that ran all day Monday and Tuesday in the Hyperledger Mini Summit room. 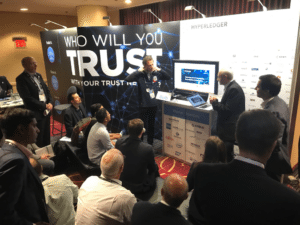 Attendees interested in how to best collaborate and get involved in the Hyperledger initiatives and learn where they can provide the most value had their bases covered in Monday’s “Meet the Hyperledger community” sessions. Speakers included the new technical staff, and diverse representation from the Technical Steering and Marketing committees, Governing Board, Identity Working Group and our fearless leader, Brian Behlendorf, Hyperledger’s executive director. In Tuesday’s Hyperledger Mini Summit sessions, members dove a bit deeper into the impact of blockchain technologies on their businesses with field reports on how they are using Hyperledger to solve their business objectives. Attendees heard technical insights from Norbloc on the KYC process, IntellectEU together with their customer Telindus (Proximus Group) on streamlined asset transactions, as well as Cloudsoft on deploying and managing global blockchain networks. Our members reinforced that blockchain is not only impacting business on a global scale, but also across industries through blockchain talks from Huawei on telecom, Daimler on the industrial enterprise, Deloitte on regulation, Energy Blockchain Labs on reversing China carbon emissions, and a panel of speakers from Accenture, BanQu and Leading Directions on blockchain for good applications. The panels were very well attended and there was great discussion on all three topics. It was most interesting that identity on the blockchain turned out to be the main topic of conversation during the security and privacy panel. And on that note, we’re excited with Hyperledger Indy just recently getting accepted into incubation under Hyperledger. Indy provides tools, libraries, and reusable components for providing digital identities rooted on blockchains. We ended Consensus with a member party atop a NYC hotel rooftop. It was such a pleasure to see everyone and we are extremely grateful for all the support our community has provided around this event and overall. We’re looking forward to next year’s event – we hope that you can join us! For those interested in additional information about Hyperledger technologies please reach out to: info@hyperledger.org. As always, we encourage developers to join our efforts via GitHub, Rocket.Chat the wiki or the mailing lists. You can also follow Hyperledger on Twitter. Blockchain technology is poised to disrupt nearly every industry from key players to core functions – and the banking and financial markets industry is at the forefront. In a recent IBM IBV Study, 15 percent of banks and 14 percent of financial market institutions said that they intend to implement full-scale, commercial blockchain solutions in 2017. Mass adoption isn’t that far off either, with roughly 65 percent of banks expecting to have blockchain solutions in production in the next three years. India’s fifth largest private bank, YES BANK, is among the first wave of institutions around the world to publicly announce innovation in payments using blockchain and cognitive technologies. Collaborating with IBM in 2015, it was the first bank in India to have launched API Banking services, which is a technology protocol allowing one access to the bank’s transaction processing services from an ERP environment in a secure manner. By capitalizing on the efficiency and security features of blockchain, YES BANK has used Hyperledger Fabric to design an innovative supply chain financing solution. It will aim to reduce the turn-around-time for an invoice to payment cycle from the current 60 days to near rapid real-time processing. This will help recognize enhanced efficiencies in terms of cost as well as resources. Using the Hyperledger Fabric 0.6, YES BANK is working to implement a permissioned blockchain network. This means that each node, or network participant, is required to prove its identity as a member of the network, thereby helping banks to maintain transaction anonymity on the shared ledger while retaining confidentiality of the contract between business users. The blockchain solution helps YES BANK resolve complex vendor payment issues. For instance, the bank’s vendor financing solution allows its client Bajaj Electricals to digitize the process for the discounting and disbursing of funds to its vendors by seamlessly integrating with the bank’s systems. The integration of both upstream and downstream systems offering automated processing of transactions greatly reduces the need for manual intervention with the help of YES BANK’s API Banking. Governing these transactions, the business logic and rules are now captured in a specifically designed “smart contract” chain code. Furthermore, implementation uses a superior Cryptokey, which offers state-of-the-art security for both documents and transactions on the Blockchain. Therefore, YES BANK helps ensure the Financial Supply Chain is more robust, secure and seamless, offering a great customer experience and making a significant impact on the overall Global Transaction Banking space. Blockchain technology ensures maximum transparency because of its structure, which does not allow for data to be altered by any one party, and works in append-only mode (meaning that records can only be added, not deleted or changed further back on the chain). This allows banks to more accurately track customer payment histories, across borders and banks, reducing the risk of defaulters. With the recent focus on the financial industry where fintechs and banks are collaborating to make user experience more positive, the transparency in the system will go a long way to transform transactions. A key consideration with the advent of blockchain technology in business is the regulatory climate. In India, government regulators are already beginning to embrace this technology, and the Reserve Bank of India acknowledged that blockchain has potential to transform India’s financial markets especially because of its inherent security and ability to combat counterfeiting. YES BANK is aiming to have a transparent decentralized ledger wherein the bank and its customers are aware of every block of information updated, thereby reducing discrepancies between the bank, its end users and vendors, allowing “auditability with accountability” for all. With blockchain technology helping to remove much of the friction in business transactions, it can be instrumental in transforming processes to ensure a better experience for all involved in its network. Companies involved in blockchain projects are introducing practical implementations of the technology, and financial institutions are among those interested in how they can use distributed ledger technology. IBM Corp. recently rolled out a service called IBM Blockchain that lets businesses build applications on its cloud with code from the Hyperledger Project, a cross-industry blockchain project. Along with IBM, some of the Hyperledger’s premier members include financial institutions like American Express Co., CME Group Inc. and JPMorgan Chase & Co. The organization is actively tracking proofs of concept in the financial industry. Canadian banks will use blockchain technology to manage consumers’ digital identities. The banks bought into the idea of managing digital identities for consumers five years ago. Initially, they focused on authentication: letting customers maintain one user name and password for multiple websites, mainly bank and government sites. The Concierge system, managed by SecureKey, was a way to simplify customers’ lives. The system stores 7 million Canadian consumers’ credentials currently with 250,000 added each month. Fintech inclusion pool Accion Frontier Inclusion Fund has announced it has raised $141 mln from major global sponsors to improve finance access in emerging markets. The fund, based in Washington D.C. and run by Quona Capital, will use cash from companies including MasterCard, JPMorgan Chase and Accion itself to assist the three bln citizens “shut out of” the global financial system. Several ideas are emerging about the adoption of blockchain in the financial services industry that are quite different than what anyone would have predicted two or three years ago. The choices banks are making are steering financial blockchains in a direction that is far from the mysterious Satoshi Nakamoto’s conception of it, and closer to more traditional technologies out there today — a Google Docs of sorts for banks with immutability and security built in. The Linux-foundation led open-source Hyperledger blockchain initiative has announced a raft of new members including influential financial institutions in the Bank of England, the UK’s central bank and the Boston branch of the Federal Reserve.